Our professionals at Action Wildlife Removal provide effective, safe, reliable and humane goose removal services in the GTA. We can efficiently remove the entire flock of goose from your property. Nowadays, these birds have infiltrated businesses, parks, play-grounds and even private residences in the GTA. Our geese removal techniques and equipments will take care of your geese problem. Goose management is a challenging task that requires an effective strategy to minimize the property damage and human-wildlife conflicts. Our professional develop a long-term goose removal and control plan specific to your individual needs. Geese are brownish-grey with a black neck and head. They have white patches on their face. Male adult geese weighs between 7-14 lbs and female geese weighs 5-12 lbs. In the spring, a goose can lay 2 to 9 eggs and incubation may last 24-28 days. Living near geese can be extremely dangerous. They can attack humans if they feel themselves to be threatened. First the geese will stand tall, spread their wings and create a loud hissing sound. This is the sign that they are charged up and may bite or attack with their wings or the large elevated hind toe. Since geese love to live around ponds and lakes with little aquatic vegetation, they often come into conflict with people. 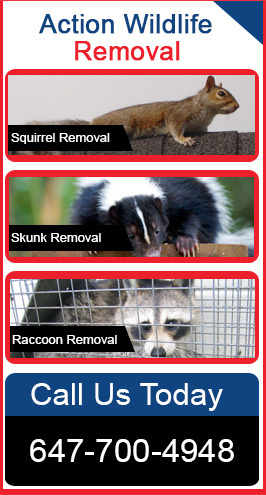 They create their nests and also defend them, causing problems when they nest near entry ways to home or business. Geese carry a transmittable disease called avian bird flu. This can be easily transmitted to humans, however such transmission is rare. When it comes to geese removal and control services in the GTA, we have various high tech tools and traps at our disposal. Action Wildlife Removal is committed to providing the most efficient, humane and practical solutions to prevent single attack geese or the entire flock of goose. We can also visit your property periodically to discourage the settlement of geese on your property. Contact us today to schedule Goose Removal Services in the GTA.